I love the Cinnamon Snail food truck – their sandwiches are always delicious, and their donuts are simply to die for (vegan bourbon crème brûlée donuts – does it get any better than that??? 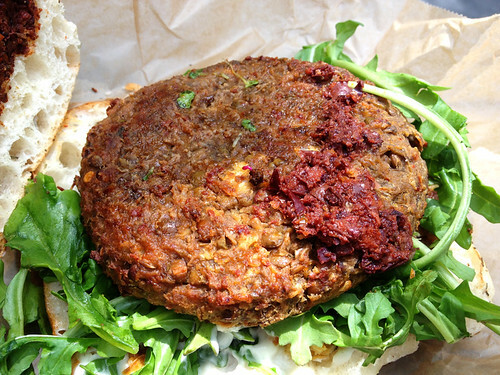 ), and their ancho chili seitan burger is one of the select few five-star burgers I have reviewed on this website! Since I’m not in Manhattan during lunch hours that often, going to the Cinnamon Snail is a special treat for me. So when the short film I was working on wrapped last Friday, and I found myself in midtown around lunch time, I seized the opportunity. Even though the line was long (this truck is always super popular! ), and the sun was hot, I just put on some sunscreen and waited patiently. And, as luck would have it, their special of the week was a new veggie burger! 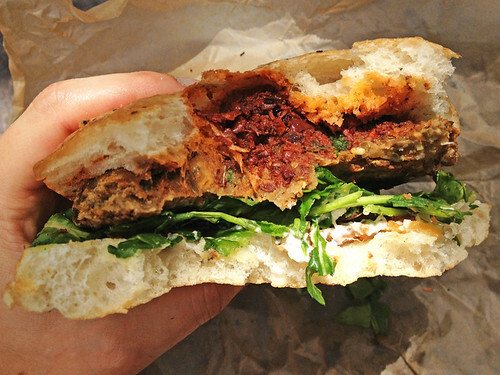 The focaccia bun was delicious, although definitely a bit large for the patty – I didn’t mind this as much on the other Cinnamon Snail veggie burger I've tried, but maybe I just wasn’t as hungry today, or I was impatient to get to the “meat” of the burger! 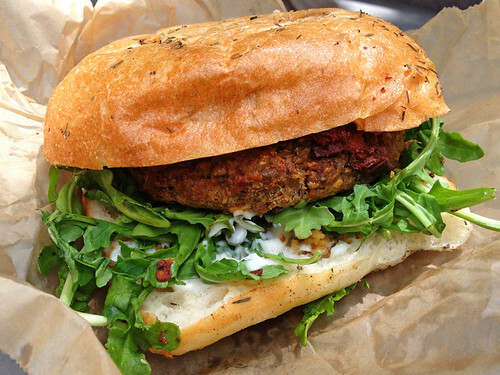 And the patty itself was really great – very earthy and just the right amount of spice. Not too mushy, and it held together wonderfully. The toppings were great too, and nice and moist which balanced the whole burger out and kept the bun and patty from seeming too dry. The sun-dried tomato and olive tapenade was rich and flavorful, the greens were delightfully fresh, and the truffled aioli was scrumptious! The fried artichokes added a nice flavor as well, but unfortunately many of the ones in my burger were just a bit too crispy (I was actually afraid I might break a tooth, and had to pull a few pieces out of the burger instead of eating them). A very satisfying lunch, although I have to say I still prefer the ancho chili seitan burger (which is on the regular menu every week). It would take a lot for another burger to come close to knocking that one off its throne though! Read my original review of that burger here. 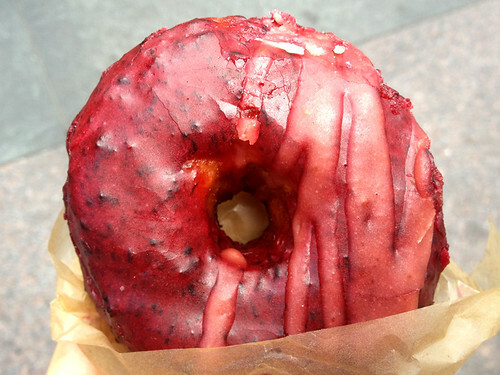 And of course I had to wash it all down with a donut – perfectly delicious, as always! Cost: I got distracted by the smell of all the yummy vegan food and forgot to note or photograph the price of this special burger… regular burgers are $9-$10, if anyone remembers what the French Lentil burger cost, let me know!